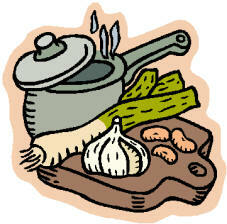 Melt butter in saucepan, sauté leeks and onions slowly until tender but not brown. Add chicken broth, parley, celery, mace, potatoes and salt. Cover, simmer until tender. Remove from heat. With a hand blender puree mixture moving blender up and down and sideways through potato mixture. Add cream and milk; blend. Return saucepan to stove; heat mixture just to boiling point. Cool, then refrigerate for several hours before serving. Serve in individual bowls. Top with chopped parsley. Serves 8 Add mace only if desired. OK... here it is! The best chili recipe you've ever eaten! This is a rich spicy chili with lot of flavor. It will warm you to the bone. Perfect for cold winter days! Angela just won the chili cook off in her office with this recipe!